Do you find yourself lusting over this beautiful car? I sure do! 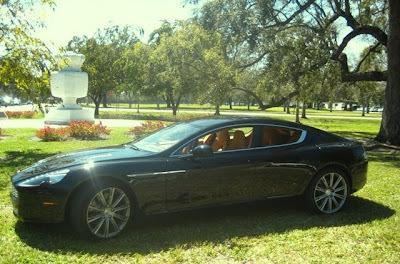 Introducing the all new Aston Martin Rapide which is now available at The Collection in Coral Gables. The world's most luxurious four-door sports sedan has arrived in Miami and I had the pleasure of test driving this baby! From the moment I saw the crystal key, I knew it would be a great ride. 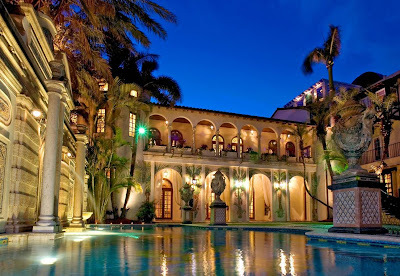 To help guide me through this experience, Mimmo Falanga, Aston Martin expert from The Collection, joined me on an exhilarating drive through the streets of Coral Gables. I mostly drove around the University of Miami because I wanted to wave "hello" to some of my former professors! GO CANES! According to Mr. Falanga, this is one of The Collection's most exclusive vehicles. Every year, the dealership only receives about four cars from the manufacturer (with a starting price of $200,000). Mr. Falanga says that most clients know exactly what they want and don't tend to ask too many questions when they walk through his door. As far as the Rapide's interior, it is completely covered in leather and suede. All occupants will be glad to find an exquisitely hand crafted and spacious cabin. You may be surprised to learn that Aston Martin has been around for 95 years. This explains why the company has developed a vehicle that is pure perfection. My favorite feature: the four ‘swan wing’ doors which open at a 70 degree angle to avoid scuffs and scratches when parked next to a raised walkway. That's what I call genius! Aston Martin engineers have spent thousands of hours tuning suspension, brakes and steering to create a car that, while practical, also provides an engaging drive. For those who wouldn't mind sitting in the back seat: check out the optional Aston Martin rear entertainment system: two LCD screens integrated into the back of the front seat headrests! Overall, it was a beautiful day in Coral Gables and my ride made it even better! To find out more information about the Aston Martin Rapide, visit http://www.astonmartin.com/ or http://www.thecollection.com/. Even though this vehicle may exceed the average car budget, it does spark an intense desire to one day be the lucky owner of a Rapide.